Wikimedia Commons/Barcex. Some rights reserved.Loomio is a decision-making software developed by a group of activists and programmers based in Wellington, New Zealand, since 2012. 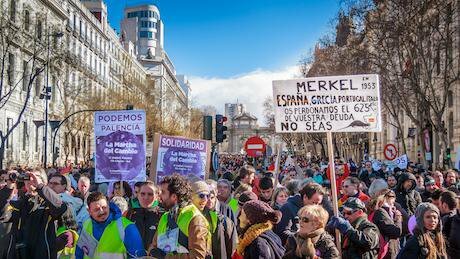 Widely used within the Circles of Podemos in Spain as well as hundreds of cooperatives, social enterprises, municipalities, and activist groups around the world, Loomio’s main feature is to nudge groups towards consensus. After discussing a proposal, every member of a Loomio group can in fact make one of four choices: agree, disagree, abstain, or block. The latter is a form of veto power, which forces the group to reconsider the initial proposal and amend it until consensus has been reached. Even though endowing individuals with such power in an online environment can be risky, Loomio groups are often extensions of preexisting offline relationships, and thus of preexisting networks of trust. Indeed, Loomio had been originally conceived by activists involved in Occupy Wellington in 2011 as a tool that could help turn the open-ended meetings of assemblies and working groups into action-oriented proposals. The four-hand signs that appear in the Loomio interface are in fact borrowed from the hand signals adopted by the Occupy movement around the world. “Ben Knight and I were in the communications working group [at Occupy Wellington],” recalls Richard Bartlett, a co-founder of Loomio. “We had a lot of people and work to manage, so we were looking for project management software, but everything we could find was based on a hierarchical attitude to organising.” Thus, together with Hannah Salmon and Jon Lemmon the two decided to contact Enspiral, a network and incubator of social enterprises based in Wellington. In 2012, Knight, Barlett, Lemmon, Alanna Krause, Aaorn Thornton and Vivien Maidaborn went on to found the Loomio cooperative, which is part of Enspiral, and currently employs eleven worker-members who have made a long-term commitment to the project. In this interview, which was first conducted on Skype and subsequently co-edited, Rich Bartlett revisits the early stages of the project, unveils the political values embedded in the design of the Loomio interface, and discusses the attempt made by a group of Spanish activists to use Loomio to scale up the deliberative processes and grassroots initiatives of the Podemos Circles from a local to a national level. Marco Deseriis: Why was your encounter with the Enspiral network important? Richard Bartlett: Because Enspiral is a network of social enterprises that are organised non-hierarchically and has many affinities with a movement like Occupy. At Occupy we had all these enthusiastic volunteers. The main question for us was how to coordinate them, keep them on task, have them deliver reliable work, without using a hierarchical method. When I went to look for project management software, I quickly realized that the majority of project management is designed for the hierarchical method, in the sense that you have someone in charge, who is allocating all the tasks, and that you have a predetermined plan of what the future is going to look like. We were looking instead for a nonhierarchical method, where no one has more rights than anyone else and where the plan can emerge organically from the bottom up. We were really stuck with that basic project management challenge. For us that was the real fodder for the conversation with Enspiral. And Alanna Krause was really good with that stuff. MD: Can you tell me a little bit about her role in the early stages of the project? RB: Soon after we met, we started a series of weekly meetings about developing a democracy software. During the meetings, Alanna was taking notes, noting the actions that we said we were going to do. So the following week the collective could look at those notes and check whether everyone had followed through. “Let me see, Jon have you done this? Ben, have you done that?” This is very basic, but I just hadn’t been exposed to such a good organizing practice before. Alanna also introduced us to Trello, a project management application that you can use in a highly democratic way as everyone can move the cards around. Out of those first meetings emerged the idea of building Loomio as a minimal decision-making tool that would complement other tools such as Slack, Trello, Google Docs, calendars, and the like. As soon as we had a very basic prototype, we started to see a lot of demand from many different sectors, not just activists and radical social entrepreneurs, but city councils and traditional businesses too. So we decided to formalise as a worker cooperative and dedicate ourselves to the project. MD: What is the added feature of Loomio as compared to the other software you mentioned? RB: All these software allow you to have a discussion but none of them has a bias towards concluding. When you have a large group of people, it is extremely common for a small minority to get highly involved in the discussion while everyone else is standing back. In Loomio a discussion comes to an end when someone decides to turn it into an actionable proposal. The proposal functions as a fresh invitation for everyone in the group to participate again. At that point, it is really common for those who had not participated in the discussion to come back and express their opinion about aspects of the conversation that had been neglected or downplayed. The added value of Loomio is that the deliberation and the conclusion are displayed side by side. The disagreement is visualized through a pie chart, in a way that you must pay attention to it, so that the concerns can be resolved. This is the difference with polls and other voting mechanisms: you can change your mind as you discuss the proposal. So it becomes almost like a game, participants have to work through the concerns and get them to change. MD: Can you explain how you came to design the user interface the way you designed it? RB: Because we are a small company, we do not have the resources to develop a comprehensive piece of software that can satisfy everything a group needs to organize. It is just too hard for us. But the idea that we have everything your group needs to make a good decision is something that is small enough and we have a credible shot at doing. One of the things we learned from Enspiral is lean, agile development practices. In both Enspiral and Occupy there is a lot of communication happening, but it is more difficult to make a decision. So the first thing we came up with was the pie chart with the four buttons. Initially, there was no discussion and no group, just a decision. And you could put that decision anywhere you wanted. If you were chatting on Slack [a messaging app for teams], you could just drop a link to the decision and then people would use it as the final record. 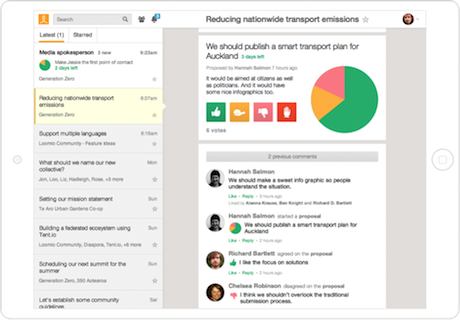 Then users started suggesting that it would be useful if we could put the discussion and the decision in the same place. And then we realized we needed to keep track of all these discussions, we needed to put them in the same place, so we embedded the group functionality. MD: Still, it seems to me that a pie chart with four buttons gives users a limited set of options. Have you ever been subject to working groups that have demanded more flexibility? RB: This is a design challenge. You can give users fewer options, as in the case of the Apple OS, or you can give them more freedom. We have decided to offer a reduced set of options, which of course is not always welcomed. For example, we often hear from people who want to be able to write multiple proposals at the same time. But we do not offer that option, because a proposal is designed to have the undivided attention of the group. That functionality would be diminished if we would have multiple proposals running at the same time. You are in a different set of mind when you ask yourself what the group can agree on. We want to push people towards convergence, without frustrating them and allowing for a certain degree of flexibility. Indeed, the minimal approach to design means that Loomio is extraordinarily adaptable to different groups, with different decision-making protocols. For example, some groups use formal consensus, some use majority rules, and others just use it for consultation and deliberation. MD: Can you give an example of how a group customized the Loomio interface to meet their particular needs? RB: Yes, I remember one particular change that came from one of the Pirate Parties. They added a fifth purple button, that says “I am committed, I am committed to do something.” When our group wants someone to take action, we simply use the Agree button and then add a text that says “agree to this proposal if you want to join a working group.” So we kind of do it without building the commitment into the interface. The Pirates decided to create an ad hoc button, which is really cool. But other than that, we haven’t seen much innovation on this level. And to be fair, it is only now that we are getting a plug-in system in place that is mature enough to allow people to experiment with alternative decision-making protocols. Now we have got the architecture where we can tolerate lots more experimentation without upsetting anyone who is expecting Loomio to work the way it has always worked. MD: What programming language is Loomio written in? MD: Have you developed a mobile version of Loomio yet? RB: We do not have an app of Loomio yet, but the interface has always been designed to work well with mobile. You can use Loomio via a browser on your phone, but you cannot go to the app store and download Loomio, not yet. MD: Are people developing their own derivative versions of Loomio? RB: We do not track it so it is hard to know. GitHub says that the code has been forked about 1,000 times. And periodically people talk on Twitter of their own version of Loomio. It is definitely out there, but we do not keep a close eye on it. And that is by design. We are aware of the security implications of activists using cloud software. It is way more secure to have many instances of the same software than to have one big central repository. MD: Why do you think it is more secure? RB: Security is always a tradeoff. You always have people saying “you should encrypt everything.” We could encrypt everything, but then you could not search the conversations because you would need first to decrypt them. Most users are happy to make that tradeoff. They would say that they prefer to have the user experience to search things than to have this rock-solid, totally impregnable security. Because Loomio.org is supporting thousands of groups we do the best we can to strike a balance between security and usability. But if you are in a different context, e.g. if you are an activist working at the border between Turkey and Syria, you might have different needs than the average. In that case, you can have full control over who has access to Loomio, you can even disconnect it from the internet and have your own internet running it. If you run Loomio on your own server you have got complete agency over the decisions that go into how to run it, rather than having to trust us, with our limited resources. Further, I suppose that any spying program is more attracted to a large target than a small one. Even though I have no evidence for this, it is probably more likely to be subject to spying if you have a million users than if you have fifty users. Loomio's Ben Knight. #LoomioLab, Medialab-Prado in Spain, via Lab O Demo/Facebook, 2014. Some rights reserved.MD: I see your argument for decentralisation. So let’s assume that the software is now resilient enough to allow for different kinds of decision-making processes to converge. 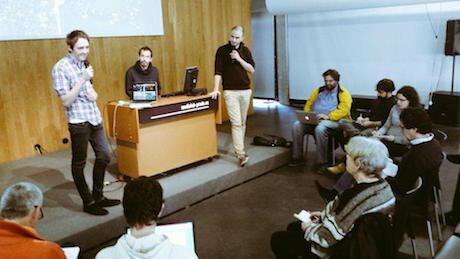 As you know, many Circles of Podemos have been using Loomio to extend meetings that happen mostly at a local level. One way for the Circles to build power from below could be to use Loomio to make some common decisions. To your knowledge, has anyone tried to use Loomio to scale up decisions from a local to a regional and national level? RB: I should give a disclaimer that I am not involved with Podemos, I have only been in Spain for a couple of weeks. But I can tell the story from the perspective of the conversations that I have had. In Madrid there is a small group of activists called Labodemo who run experiments in democracy. They research technologies, test them, and then offer them to social movements as they arise. Labodemo discovered Loomio and tested it out very early on. They understood its capability and communicated it to others and in particular to the Podemos Circles. Just to give you a sense, Loomio usage in Spain accounted for 5% of our total traffic in 2013, jumped to 54% in 2014, and is currently around 40%. I think that this is because the cultural, historical, and political context is way more consensus-oriented in Spain than in most parts of the world. In January 2015, we received a request from Miguel Arana Catania, one of the activists in LaboDemo, and currently the Director of the Madrid City Council Participation Project. Miguel told us that they were aware of the massive use of Loomio within the Circles of Podemos and asked us whether there was some way to bring this together and take it to the next level. MD: What was the next level? MD: So nobody thought about connecting the Circles among themselves and to the Podemos’ ruling group until the general election of December 2015. RB: Not really, because we decided to follow through with the request we received from LaboDemo in January 2015. We searched the database for groups that had the word Podemos in it. We found 2,500 groups that had been started by 2,500 individuals. That’s already a very peculiar situation. You have all these different groups of people who share some a sense of collective identity, but that have been independently motivated to start a Loomio. That’s a very promising social condition that I do not expect to see again anytime soon. So we thought to give these groups mutual visibility by creating something we called “The Network,” which was just a name for an invented architecture. Then we created an index of all the discussions and the decisions that were happening within the Network. That’s as far as we got. The intention was to get the location information for all of these groups because so many of them are geographically organised. Then we imagined the figure of a Network coordinator, who could put out a proposal to all of the circles to discuss collectively certain topics. Each Circle would then be able to see everyone else’s discussion but only the locals could have talked to each other. For example, a Podemos member would be able to see what has been decided in Barcelona and she could share that information manually with others in her Circle, but there was no General Assembly space. MD: Were you able to implement any part of this plan? RB: No, because political reality got in the way. The Party got more and more hungry for power, and pushed itself further and further away from the Circles. So the Circles became this place of militant energy, which aspired to take the power back from the Party. For me this is not a failure, it is just a mixed experiment, a very peculiar experiment, and something we are going to learn from. More in general, I think it is very attractive to think about large-scale digital democracy and imagine that the right technology will give us a fundamentally different approach to government. It is really enticing to think in those terms. My perspective is that you are always going to wind up with the problem of deliberation regardless of the system of government you have. You can implement a very complex system of proxies and delegations, as in the case of LiquidFeeback, but you are still going to wind up with deliberation, that is, with how you get a small group of people to negotiate, organize, make compromises, and build consensus. That’s why we put our focus on how to train and support people in the heart of deliberation. Because this is what democracy is ultimately all about. MD: But there is a difference between the kind of deliberation you can have within a Loomio Circle and the deliberation of Podemos’ ruling group. RB: Yes and no. Podemos’ political direction is made up of a group of people who are deliberating all the time. One of my frustrations with the current political system is that most people are alienated from deliberation, they don’t ever have a chance to practice deliberation. We don’t do it in school, we don’t do it in the workplace, and we don’t do it in our political system. We don’t learn the skills on how to do it. So you have people in the streets with really naïve expectations about how government should operate. Because they have never practiced making a compromise, making a negotiation, coming to a “good enough” consensus between disparate parties. That is the work of democracy, and most people are excluded from practicing it ever. And then you have people working inside the government who are practicing deliberation all the time. And they look at the citizens and they go like “ah, you are really naïve, you are irrational, you don’t really know what you are talking about. You can’t be trusted and that’s why we need to have a vanguard, we need to have professional decision-makers.” In response to this attitude, at Loomio we say let us give everyone access to the skills of deliberation. This is what was transformative with the General Assembly at Occupy. People realized that every single person has a different subjectivity and that if you put a great deal of trust, empathy, and good process, you can identify the intersection between those subjectivities and build a thing called consensus. This was mind-blowing to people as they never had a chance to practice it before. It is difficult to transform our political structure without lots of people practicing deliberation in their everyday lives. MD: I see your point. At the same time, we could say that the deliberations that go on within the central committee of Podemos have the power to affect everybody else in the party, but not vice versa. By deciding not to listen to the instances that were coming from the party base, Podemos’ leadership syphoned out a lot of enthusiasm that existed within the party. So their internal deliberations had a negative effect on all the other deliberative processes, which were deprived of their capacity to have a real impact on the party’s strategic direction. RB: I agree, the Podemos leadership shot itself in the foot and a lot of energy got syphoned out of the party. But what you cannot syphon out is the experience that people had, and the expectations that they now have to see their direct participation have a tangible outcome. 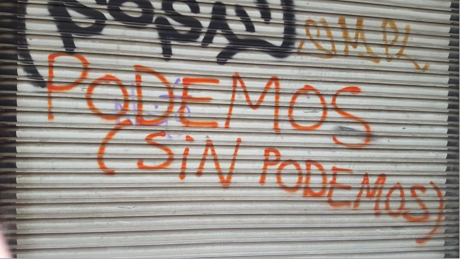 In my understanding, in Spain so many activists now look at Podemos and say “we don’t care.” I was there last February and saw this wonderful graffiti that read Podemos (sin Podemos), “We Can (without Podemos).” They have given up on the national level and they are putting all of their energies into the city level. These radical coalitions all over Spain are getting real traction, they are getting things to change. And there is a loose alliance between them, but not an overarching label. For me that is extraordinarily promising. MD: Yes, but the professional class of politicians that makes up the national level will keep mediating between the local realities. It is all to be seen whether the municipal experiments can scale up without this professional class of mediators. Whereas I am enthusiastic as everyone else about the municipal experiments, I am not going to be satisfied as long as the national and even the supranational layers remain insulated from these participatory processes. RB: Yes, of course, I am never going to be satisfied. But I am in this for the pursuit, the sense of progress, the struggle. If there are people now living in cities where they have a drastically increased level of participation in their day-to-day life, that is going to leave them with a sense of expectation on how their country and the world should operate. And of course I do not expect to see a linear progression. It is entirely possible that these processes in Spain are over, or that Podemos has done more harm than good. But look for example at what is happening in Taiwan, which is currently the most advanced experiment in the world in democratic participation: it’s common practice for citizens there to have direct participation in law-making now. This is thanks to a little bit of technology and a lot of activism. The activists in Taiwan learned a great deal from those in Spain. They learned from people in Tunisia, and now they’re passing their lessons on to people in France. All around the world, there are local incarnations, new experiments in participation. This supranational network already exists, and it is evolving faster than any institutions. We just need to keep making friends across borders, sharing experiences, and learning from each other.